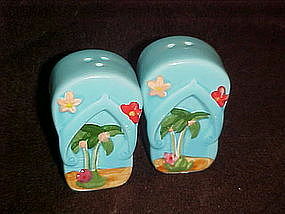 Hand painted glazed ceramic salt and pepper shakers are very "Hawaiian island" themed. turquoise blue of the water and skies and palm trees, and hibiscus flowers decoration. Measures almost 3" tall and have orininal stoppers. Perfect condition.